Cap Ferrat is split into two capes, a small one, sticking out like a thumb to the east and a big cape, the stretched fingers to the west. The fingers is where all the expensive properties are. On the thumb cape the properties are also in the 10+ million Euro range but they would appear to be family owned and probably never change hands. This gives this part of the cape a feeling of established continuity. On the peak of this beautiful thumb is a very peaceful cemetery and chapel, named after St Hospice. This saint had dedicated his life to loving God and he wished to do nothing else but spend his waking hours praying in worship. Occasionally he would turn to the sinners in town and remind them to do as he did and turn their backs on drinking, gambling and whatever other sins they delivered themselves to. They laughed at him and told him to mind his own business. The good saint tried this a few times too many and one day the bad men killed him. The good folk of the village of St Jean felt bad and build the beautiful chapel in his memory and honour in what must be one of the most exceptional spots in the whole of France. Given that he received his sainthood, St Hospice must have done more than praying and presumably he must have saved more than a few sinners. Next to the chapel is a cemetery where wealthy families attempt to extend their stay on this most beautiful cape. They probably don’t appreciate it much from their graves but visitors like myself certainly do. Between this cemetery and the chapel is an altogether more touching story. There, on a narrow ledge is a military graveyard for 80 belgian soldiers who died at St Jean during the 1st world war while they were being treated for gas inflicted wounds. One can only imagine the final horrific days of their lives here and we may only hope that the soft sea air gave them a little respite. War graves make me terribly sad. I can spend hours reading names on these graves and resurrect these men for a just few seconds each. My grandmother died aged 40 in a japanese concentration camp in WWII and her complete absence in my life and more so, the lifelong pain felt by her daughter, my mother who was also imprisoned in that camp, has made the suffering caused by war part of who I am. War graves bring out that sadness and powerless feeling that these people should have lived. Take Renaat van Snick here. According to the inscription, this belgian soldier died aged 30. He was a pharmacist and given his age, he was probably married. He may even have had children. He would have worked hard at school to go to university and get that toughest of degrees. His parents would have been so proud. When he graduated the first thing he did was to race to his bicycle to his fiancee and given her the good news. Now they could get married! She was widowed only a few years later. When their first son turned 30, another war broke out and hell would have been repeated all over again. Rest in peace Renaat. We have remembered you here. Next to Renaat are two brothers, Karel and Emiel d’Hoore. Like Renaat, Karel died aged 30 but his little brother Emiel was only 18. They were foot soldiers and may well have seen the horrors of the front trenches. Poor Emiel, he was just old enough to be dating girls and enjoy a good pint of belgian beer when he was sent to war. His older brother would have felt so responsible. I imagine his mother giving Emiel a letter for Karel to bring him back safe. They died within four months of each other here at Cap Ferrat. We may only hope that they had some time together as they were treated here. Rest in peace, Karel and Emiel. We remembered you today. There are 77 more fallen men here. Their lives were robbed from them by crazy old men who wanted what wasn’t theirs. Crazy old men who wanted to redraw lines of power and re-establish society, beliefs, old gripes etc. Crazy old men who convinced themselves and others of the need for pre-emptive action or simply proactive strikes for their grandiose empires. But as Eckhard Tolle asks, are we not all members of that human race that killed 100 million of their own kind in the last century? I can’t get angry here. The peace of these graves won’t allow it. As I leave the cemetery, Renaat, Karel and Emiel reach out to me, whispering. Next time, old man, don’t do it. We are not dusty souls from a distant war. We are your sons. Don’t let us die again. Remember that. I will let them have the last word in this blog post today. We are your sons. Remember that. Loved the story of the saint. You write, “…hey laughed at him and told him to mind his own business. The good saint tried this a few times too many and one day the bad men killed him……” Does this imply that “minding one’s business” leads to one coming to grief? I remain intrigued…. 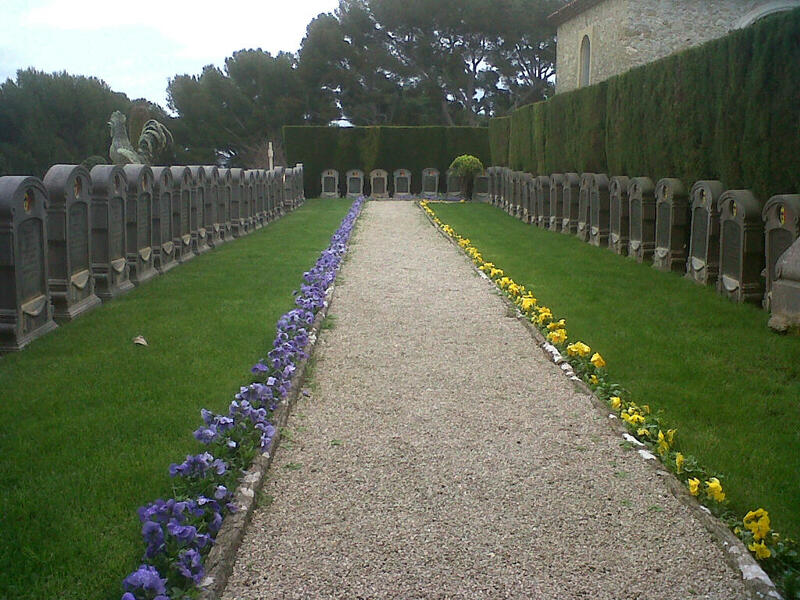 Great post:) Cemeteries tell so many stories, I visit them any place I travel. My favorites are Pere Lachaise in Paris, Colon in Havana, and the ancient un-named pet cemetery on Whyte Lake Rd. near Keremeos B.C. Perhaps we should call them story yards 🙂 Any writer stuck for characters could pick some real gems there! My favourite so far is Orta St Guillio in Italy. The place is so full of ambiance that you almost have to elbow your way through the ghosts to make your way around. Next time I’m in Paris, I’ll see if Père Lachaise is anywhere near. Thanks for the tip! I stumbled across this graveyard last year, it is peaceful yet had a powerful effect on me. As you said I hope they had some respite, despite their horrific injuries. may they rest in peace and be a warning what horrors man can do to man! I’m glad you were there. In an age where we get live footage of men, women and children dying at the hands of men, women and children, such graves are a reminder of the pointlessness of these killings. There is only loss, sadness and pain. No side ever gains or wins. May they rest in peace.